Green or red Chillies chopped 2 no. Wash the rice and moong dal separately. Soak rice in 3 cups of water for about 2 hours.Soak dal in enough water to cover. Grind rice, with 1 cup of water to a coarse consistency, add salt.Transfer to a vessel. Drain moong dal completely,mix it into the ground rice. Put the oil in a skillet over medium heat. When the oil is hot but not smoking, add cumin seeds ,and chillies,curry leaves . Add ground rice mixed moong dal and stir it. Pour about 1 1/2 cups of water in it, stirring frequently over medium heat, till the rice is cooked to the consistency to make balls, switch off the flame. Add coconut and mix well, Cool the mixture. 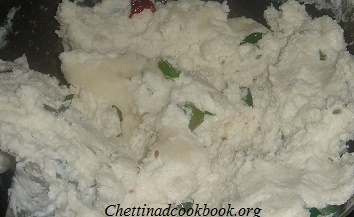 Shape into small lemon sized, oval-shaped balls and steam- cook for 10-12 minutes, placing it on Idly plates. 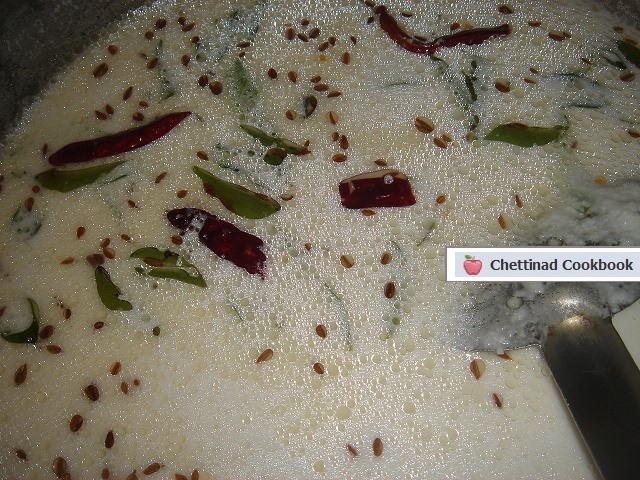 Serve with Kanagambara thovayal, tomato or chilli chutney.